Background: The illicit tobacco trade results in huge losses of revenue to governments, estimated at $US40–50 billion in 2006, and in increased consumption and thus health problems because it makes tobacco available more cheaply. On 20 October 2008 the second meeting of the International Negotiating Body (INB2) on the illicit trade protocol of WHO’s Framework Convention on Tobacco Control (FCTC) will discuss measures to tackle the illicit trade in tobacco products. Methods: This paper presents the experience over the last decade of three countries, Italy, Spain and the United Kingdom, which shows that tobacco smuggling can be successfully tackled. Conclusion: The evidence strongly suggests that the key to controlling smuggling is controlling the supply chain, and that the supply chain is controlled to a great extent by the tobacco industry. The illicit tobacco trade results in huge losses of revenue to governments, estimated at approximately $US40–50 billion in 2006,1 and in increased consumption and thus health problems, because it makes tobacco available more cheaply.2 In February 2008 negotiations started on a protocol to the World Health Organization Framework Convention on Tobacco Control (FCTC),2 to prevent illicit trade in tobacco products, and the second meeting of the International Negotiating Body on the Protocol (INB2) starts on 20 October 2008 in Geneva. Article 15 of the FCTC states that the convention should deal with all forms of illicit trade in tobacco products, including smuggling, illicit manufacturing and counterfeiting. In this paper, in which we focus on large-scale organised smuggling,11 we describe the cigarette export practices which targeted the illegal market in the United Kingdom, Spain and Italy, and show how substantial reductions in smuggling were achieved over the last decade. These export practices came under scrutiny in the UK parliament’s Public Accounts Committee hearings in May and June 2002,16 when members of the committee questioned the Imperial Tobacco chief executive (box 1). Committee: … you said you believed you sold to legitimate consumers in Latvia, and in Latvia you sold 1.7 billion cigarettes in the year 1999–2000, and then the following year 1.4 billion cigarettes. Do you know the population of Latvia? Mr Davis: I do not know the precise figure. Committee: It is 2.3 million, which means each person, man, woman and child, including non-smokers, would have had to have smoked 722 cigarettes, which is 36 packets a year. When you were selling Regal and Superkings to this market, given it is a brand mainly sold in the UK, what did you think you were doing? Who did you think was buying these things and why did you think they were legitimate? Mr Davis: I think you should understand that Latvia is a hub market, so the cigarettes were not just consumed in Latvia but in other markets in Eastern Europe. So I understand your arithmetic but the fact remains … . Committee: What I find puzzling is, if it is a hub market why did it suddenly completely collapse down to 1,290,000? I said 722 cigarettes per person, that is a drop from 1999 to 2001 from 722 cigarettes per person to half a cigarette per person, that is a fairly precipitous fall in the market. What happened? Mr Davis: We discontinued supply. Mr Davis: Because product was coming back into the UK. We made efforts to identify how that was happening and we could not guarantee that we would conform to our supply policy because product was coming back, so we ceased supply. Committee: So you chose Afghanistan, the source of 98% of the world’s heroin; you chose Moldova, the largest source of human prostitution in terms of women being smuggled into Western Europe; you chose Kaliningrad, which is notorious as a crime-ridden enclave of the former Soviet Union and is notorious as being run by criminal gangsters. You chose some pretty odd locations. One comes to the conclusion that you are either crooks or you are stupid, and you do not look very stupid. How can you possibly have sold cigarettes to Latvia, Kaliningrad, Afghanistan and Moldova in the expectation that those were just going to be used by the indigenous population or exported legitimately to neighbouring countries, and not in the expectation they would be smuggled? You must know—you only have to read a newspaper every day, a member of the public could tell you—these are places which are linked to organised crime, that the drugs trade passes through all of these countries, that prostitution passes through all these countries. Did you not know that? In 2000 the UK government also announced an anti-smuggling action plan, which included scanners for container detection, prominent fiscal marks on packs, increased punishment, more customs officers and a campaign to increase public awareness,14 which halted the increase of smuggling in 2000–1 and 2001–2. Sources: references 30, 31, 33–37. By 1998 European governments and European Community (EC) officials believed that the manufacturers were selling American cigarettes to traders who resold them into black markets set up to evade foreign taxes, and had begun investigations.38 In November 2000 in New York, the EC filed a civil action against Phillip Morris and RJ Reynolds, accusing the companies of “an ongoing global scheme to smuggle cigarettes, launder the proceeds of narcotics trafficking, obstruct government oversight of the tobacco industry, fix prices, bribe foreign public officials, and conduct illegal trade with terrorist groups and state sponsors of terrorism.”.33 In 2001 ten EU countries, led by Italy,39 joined the lawsuit. 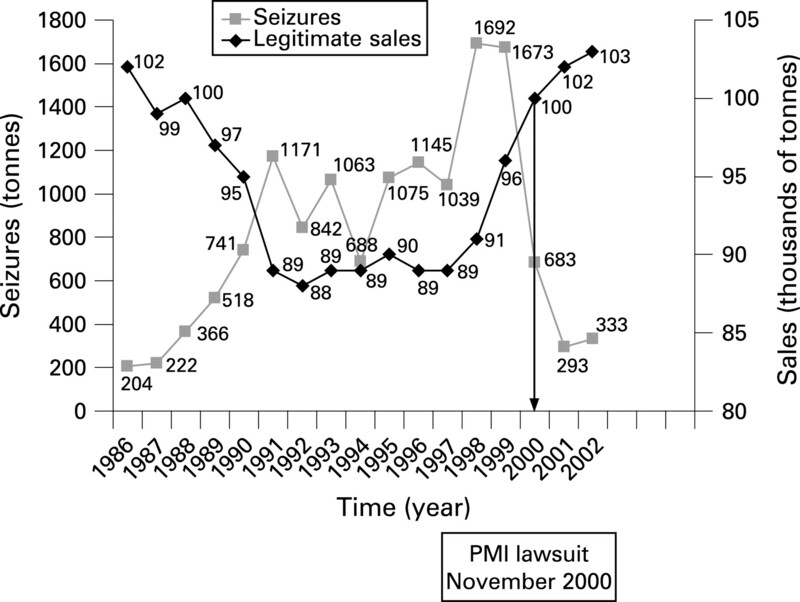 In 2004 the EC and member states dropped the case against Phillip Morris in return for an enforceable and legally binding agreement (which did not constitute an admission of liability by PMI).40 41 Under the agreement PMI agreed to pay the EC $1 billion over 12 years.40 PMI also had to make substantial additional payments if smuggled PMI cigarettes continued to be seized by the authorities. The agreement also required PMI to control future smuggling through a range of measures, which included controlling the distribution system and contractors supplied, and tracking and tracing measures. In order to effectively combat illicit trade in tobacco products, law enforcement authorities need to be able to monitor the movement of lawfully manufactured tobacco products as they travel through the supply chain, and re-create the route taken by lawfully manufactured tobacco products that they have seized.42 PMI, for instance, marks master cases (containing 10 000 cigarettes) with unique, machine scannable barcode labels before selling to a first purchaser (see box 2). Since 2004 PMI has marked 200 million master cases containing 2000 billion cigarettes with such a unique code. Currently the labels are limited to the master cases but under the agreement “PMI shall maintain an ongoing program of research and development concerning methods and technologies for improving Carton and Pack Coding technologies.” In 2008 PMI is gradually introducing the tracking of the cartons in smuggling sensitive markets, such as Russia and Ukraine. At pack level PMI is experimenting and applying unique codes on the individual packs in the German and Peruvian market (the information on the PMI tracking and tracing system was collected during a visit, organised by the European Anti Fraud Office (OLAF) on 8 July 2008 in Neufchatel, Switzerland). Data on legal sales of foreign cigarettes in Campania and Puglia show a large increase from 1998 to 2000, reflecting how illicit foreign cigarettes became unavailable over that period, obliging smokers to buy legal foreign cigarettes. Over this period legal foreign cigarette sales increased 121% in Campania, 55% in Puglia and 19% in the whole of Italy (table 2) (Lorenzo Spizzichino, Italian Institute for Statistics (ISTAT), Italian Ministry of Health, 8 April 2008, personal communication). From 1993–1996 to 1996–2000 the resources Spain invested in combating cigarette smuggling rose from €4 million to almost €40 million.47 Over this period the market share of smuggled cigarettes decreased from 16% to 2% and cigarette tax revenue rose from €2300 million to €5200 million45 (fig 3). An investment of €44 million led to an increase in revenue of almost €3000 million. In addition, to take action against large-scale smuggling, Spain collaborated with OLAF to prevent cigarettes illegally entering the country from Gibraltar and Andorra. In Andorra this included sealing the border and political pressure on the Andorran government by the EC and member states, which forced Andorra to pass legislation making it illegal to smuggle tobacco into neighbouring countries.47 The Spanish customs authorities said that their success was not due to controlling distribution at street level, which is almost impossible, but to reducing supply into the country at container level, through intelligence, customs activity and improved national and European cooperation and technology.9 All these measures, including the investigations of US tobacco companies and the 2000 EC lawsuit they led to, resulted in the supply of American cigarettes into the illegal market in Spain being cut off. Anti-smuggling measures in the United Kingdom included scanners for container detection, prominent fiscal marks on packs, increased punishment, more customs officers and parliamentary hearings that exposed tobacco industry export practices. Large-scale container fraud fell significantly between 2000–1 and 2005–6. When the industry stopped exporting Regal and Superkings that were re-imported to the illicit market, there was a huge fall in customs seizures of these brands coming back into the country, dramatically illustrating that cutting off the supply to the illicit market led directly to a fall in smuggling. 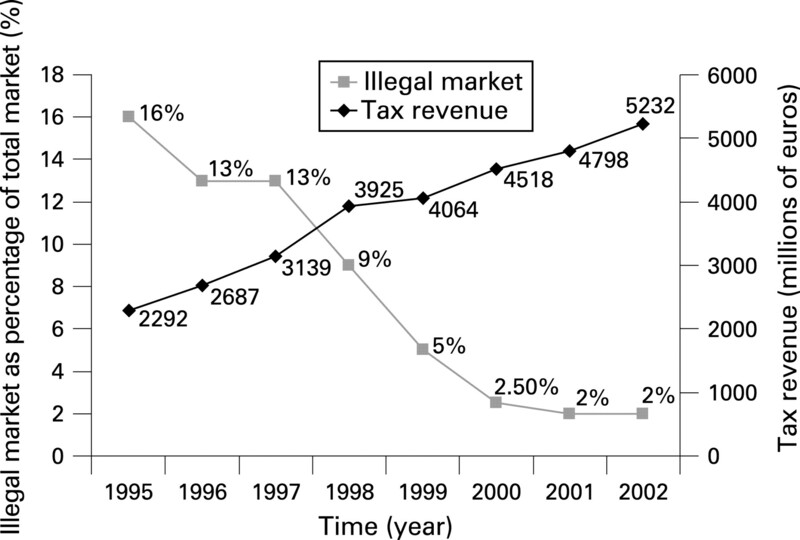 In Italy, following Italian and European investigations, which led to legal action against the tobacco industry, and subsequently to a binding agreement with Phillip Morris, there was a dramatic fall in customs seizures and a corresponding rise in legal sales. Supply of smuggled cigarettes into Spain was reduced by a combination of measures, including intelligence, customs activity in border areas and international cooperation, both within Europe and with US authorities over the supply of seized US brands. The OLAF investigation of the tobacco companies in the United States in 1998 and the Spanish and Italian customs activities and ensuing lawsuit against American tobacco companies also appear to have had a significant impact. Over the period covered by these actions there was a dramatic fall in US exports to Europe. A plausible interpretation of the data is that the industry changed its export practices promptly in response to the investigations. What the investigations and threat of legal action did was change the risk-benefit equation for the industry. The prospect of a lawsuit and possible financial penalties increased the risks of supplying cigarettes that were reaching the illicit market and reduced the benefits. The changes in export practices were then reinforced and consolidated by the formal, legally binding agreement. All three examples have one common factor: smuggling was reduced by interrupting the supply chain from the manufacturers to the illicit market. In Italy and Spain international cooperation was also crucial. Although we have focused in this article on large-scale organised smuggling, it is only one type of the illicit tobacco trade and a treaty to combat illicit trade needs to deal with all its forms. In the United Kingdom, for example, where the illegal cigarette market remains high, at 13% in 2005–6, bootlegging and counterfeit still result in cheap products reaching the market, thus representing a serious health problem. These data strongly suggest that the key to controlling large-scale organised tobacco smuggling is cutting off supply to the illicit market—turning off the tap.12 The UK experience shows quite clearly how investigation of one tobacco company, with the implied threat of legal or punitive action, led directly to a fall in smuggling. In fact the chief executive himself explained what happened when asked why there had been a precipitous fall in one of its “unclear” export markets, Latvia: “We discontinued supply.” The data from Spain and Italy show that the industry is able to a great extent to control the supply chain, so that when it considers that smuggling becomes too risky, it stops supplying the illicit market, and its brands are no longer available in those illicit markets. This paper builds on our knowledge of the nature of large-scale cigarette smuggling. We know that the tobacco industry has supplied cigarettes on a large scale that find their way into the contraband market, losing governments tax revenue, and increasing consumption and health problems by so doing. This paper adds data from experience in three countries over the last 10 years, which show that large-scale cigarette smuggling can be tackled, and which show that the key to tackling cigarette smuggling is to cut off supply to the illicit market. Controlling the supply chain should be at the heart of the FCTC protocol on the illicit tobacco trade. We gratefully acknowledge financial support from Bloomberg Philanthropies and Deborah Arnott, Alison Cox, Jonathan Liberman and Francis Thompson for extremely helpful comments on the first draft of this article. We would also like to thank the refererees for very helpful feedback.
. How big was the illicit tobacco trade problem in 2006. FCA Fact sheets for INB1. Geneva: FCA, February 2008.
. Smuggling treaty could reduce tobacco toll. Lancet 2008;371:458–60.
. Complicity in contraband: British American Tobacco and cigarette smuggling in Asia. Tob Control 2004;13(suppl II):ii96–ii111.
. ‘Key to the future’: British American Tobacco and cigarette smuggling in China. PLoS Med 2006;3:228–37.
. British American Tobacco and the “insidious impact of illicit trade” in cigarettes across Africa. Tob Control 2008;doi:10.1136/tc.2008.025999 (in press).
. Smuggling as the “key to a combined market”: British American Tobacco in Lebanon. Tob Control (in press).
. Dilemma of a cigarette exporter. Guardian 3 February 2000.
. Federal and provincial governments reach landmark settlement with tobacco companies. Quebec: Canada Revenue Agency, Press release, 31 July 2008, http://www.cra-arc.gc.ca/nwsrm/rlss/2008/m07/nr080731-eng.html (accessed 10 August 2008).
. How can cigarette smuggling be reduced? BMJ 2000;321:947–50.
. Tobacco firms hit with $1 billion in penalties. Toronto Globe and Mail 31 July 2008. http://www.theglobeandmail.com/servlet/story/RTGAM.20080731.wtobacco0731/EmailBNStory/National/home (accessed 10 August 2008).
. Glossary of terms in the illicit trade in tobacco products. FCA Fact sheets for INB1. Geneva: FCA, February 2008.
. Turning off the tap. An update on cigarette smuggling in the UK and Sweden, with recommendations to control smuggling. London and Stockholm: Cancer Research UK and National Institute of Public Health, 2002.
. World cigarettes 1. The 2007 Survey: Italy and Spain. Suffolk, ERC, 2007.
. Tackling tobacco smuggling. London: HM Treasury, 2000.
. Departmental autumn performance report 2007. London: HM Treasury, 2007.
. Third report: tobacco smuggling, HC143. London: Houses of Parliament, 2003. http://www.publications.parliament.uk/pa/cm200203/cmselect/cmpubacc/143/2061901.htm (accessed 22 August 2008).
. Treasury minutes on the first to the third reports from the Committee of Public Accounts 2002–2003. Third report: tobacco smuggling. Norwich, HM Stationery Office, 2003. http://www.archive2.official-documents.co.uk/document/cm57/5770/5770.pdf (accessed 23 May 2008).
. Measuring indirect tax losses-2007. London: HM Treasury, 2007.
. Key features of the agreement on smuggling between the EC and Philip Morris. London: ASH, 9 July 2004.
. Gallaher International Limited and Tlais Enterprises Limited, Case No: 2005 Folio 185, Approved Judgement, 18 April 2008, paragraph 11.
. Gallaher International limited and Tlais Enterprises Limited, Case No: 2005 Folio 185, Approved judgement, 18 April 2008, paragraph 437.
. Smuggling: court case smokes out Gallaher. Sunday Times 27 April 2008. http://business.timesonline.co.uk/tol/business/industry_sectors/consumer_goods/article3821693.ece?token = null&offset = 12 (accessed 18 May 2008).
. £5m penalties for tobacco manufacturers who aid smuggling, press release. London: HM Revenue and Customs, 29 September 2006, http://www.gnn.gov.uk/content/detail.asp?NewsAreaID = 2&ReleaseID = 230890 (accessed 9 August 2008).
. Smuggling and cross border shopping of tobacco in Europe. BMJ 1995;310:1393–7.
. Tobacco and alcohol smuggling. Parliamentary answer. Hansard, 7 March 2001, column 230W.
. Contraband and counterfeit cigarettes: frequently asked questions. Brussels, European Commission, 14 December 2007. http://www.europa.eu/rapid/pressReleasesAction.do?reference = MEMO/07/584&format = HTML&aged = 0&language = EN&guiLanguage = en (accessed 8 May 2008).
. A zone of ambiguity. The political economy of cigarette bootlegging. Br J Criminol 2007;47:551–71.
. Key cigarette retail pricing information—EU and neighbouring countries. Lausanne: PMI, January 2008.
. 28 Million counterfeit cigarettes seized at Felixstowe, press release. 26 September 2006, http://www.gnn.gov.uk/Content/Detail.asp?ReleaseID = 229596&NewsAreaID = 2 (accessed 19 May 2008).
. Committee of inquiry into the Community Transit System. Final report and recommendations. Volume I. Brussels: European Parliament, 1997.
. Relazione sul fenomeno criminale del contrabbando di tabacchi lavoratori esteri in Italia e in Europa, approvato dalla Commissione in data 6 marzo 2001.
. Naples Journal: Live by the rules? A smugglers’ haven smolders. New York Times 7 March 1994. http://query.nytimes.com/gst/fullpage.html?res = 9A04E5DF1F3AF934A35750C0A962958260&sec = &spon = &pagewanted = 2, accessed 18 April 2008.
. European Community complaint against Philip Morris, RJ Reynolds and Japan Tobacco. United States District Court, Eastern District of New York, New York, 3 November 2000, http://www.nyed.uscourts.gov/pub/rulings/cv/2000/00cv6617cmp.pdf (accessed 19 April 2008).
. Tobacco companies linked to criminal organizations in cigarette smuggling in Italy. Washington DC: Center for Public Integrity, 3 March 2000, http://www.publicintegrity.org/report.aspx?aid = 351 (accessed 19 April 2008).
. Two cases shed light on cigarette smuggling in Italy. New York Times 2 September 1997, http://query.nytimes.com/gst/fullpage.html?res = 9803EED91630F931A3575AC0A961958260 (accessed 19 April 2008).
. Cigarette makers are seen as aiding rise in smuggling. New York Times 25 August 1997.
. Cigarette smuggling in Europe: who really benefits. Tob Control 1998;7:66–71.
. Europe turning to US to fight illicit cigarettes. New York Times 7 May 1998.
. Italy backs lawsuit against US tobacco giants. Reuters 6 November 2000.
. Payments by Philip Morris International, Inc. under the Anti-Contraband and Anti-Counterfeit Agreement: the European Community and 10 Member States agree the distribution of approximately 1 billion USD. Brussels: Europa, 5 October 2006.
. Factsheet about the EU Agreements with tobacco manufacturers to control the illicit trade in tobacco. FCA Factsheets for INB-1. Geneva: FCA, February 2008.
. Comments on the template for a protocol on illicit trade in tobacco products (policy briefing). Geneva: FCA, February 2008. http://www.fctc.org/docs/documents/fca-2008-inb-illicit-trade-inb1-briefing-comments-on-protocol-template-en.pdf.
. Annual reports, 1986 to 2003. Rome, Guardia di Finanza.
. Tobacco: World Markets and Trade. Foreign Agricultural Service, Circular Series. February 1998 and 2002. Washington, USDA, 2002.
. Evolución del contrabando de tabaco en España. Prevención del tabaquismo 2003;5:127–35.
. Report on smuggling control in Spain. Geneva: World Health Organization, 2003.
. Gallaher International Limited and Tlais Enterprises Limited, Cross examination of Mr Terrance Denis Byrne, Director General Law Enforcement, HM Customs and Excise. 23 May 2007.
. Elaboration of protocols (decision FCTC/COP1(16)) elaboration of a template for a protocol on illicit trade in tobacco products. Geneva: WHO, 19 April 2007. Funding: We gratefully acknowledge financial support from Bloomberg Philanthropies, New York, UK. Neither author has any connection with the funder apart from the latter’s provision of support, nor did the funder participate in any way in the writing of the article. © Joossens et al 2008 This is an open-access article distributed under the terms of the Creative Commons Attribution License, which permits unrestricted use, distribution, and reproduction in any medium, provided the original work is properly cited.